TITLE COFFEE FILTER BIRDS NESTS FOR EASTER PLACECARDS. DESCRIPTION A small nest using coffee filters, paint, and leaves. 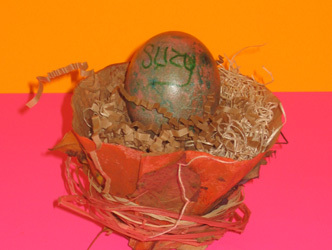 We are using these little nests with a dyed egg snuggled inside as place cards at our Easter table. Each egg will have a name written on it so all will know where to sit. Begin by turning the filter inside out so the seam is inside. Sponge paint the outside on both sides with a combination of paints (we used brown and orange). Allow to dry. If your time is limited, you might do this prior to working with the children so you don't have to wait while things dry. Gather some dried leaves. Using a glue gun, fasten a scattering of leaves to make things look authentic, but don't cover the whole nest, you're going to want to squish the nest together which will be difficult with too many leaves. Find a rock to fit in the bottom so the nest will have a base. Fill the nest with raffia, and tuck in the egg. We wrapped our nest with colored raffia, tying it to squish the nest together a little more tightly. Smaller children will need help with this step. MATERIALS NEEDED Coffee filters, glue gun, paint, sponges, leaves, dyed egg, small rock, rafia.